Saturday was our first official full day living on campus. On Friday we cleared our stuff out of our Jinja house and brought it all here. We really enjoyed our first Saturday at Good Shepherd's Fold. Most of the day was spent settling in here, cleaning, putting away, and organizing. In the afternoon we took a little break from our work inside and did some gardening at the schoolhouse. It was fun to work on that project to beautify the area around where we work and live. Our older kids also had the opportunity to go to a class with the children who live here at GSF about making crafts with Banana Fibers. Jonah, who grew up here at GSF and now makes and sells these type of crafts, has been coming back on Saturdays to teach the children here. It is neat to see how he is investing in the next generation of GSF kids. In this picture you can also see our home in the background. It is a duplex and we live in the left half. You can also see David working on his gardening project, while teaching Ezra and Chad, a young man who has been growing up here. Later that evening we invited the other missionary families over for a game night. We spent much of the time playing Dutch Blitz. I found out that I am not the only one who is competitive while playing games. ;) There was even some hand slapping when someone else played a card first. We laughed a lot and it was good to be here with the team. Our game night continued late, so our kids had a later bedtime, so they crashed quickly and slept well. 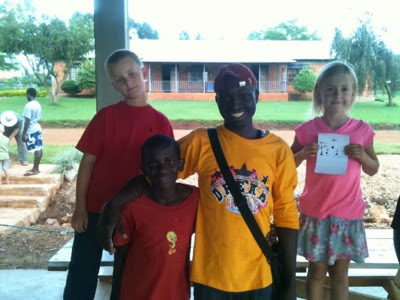 On Sunday our kids attended Sunday school at GSF, then we walked to church in Buundo. We do not know many of the songs yet, but we can clap and dance until we learn the words. There are not any hymnals or even bulletins with praise songs printed here. You just have to learn the songs. Esther went to children's choir practice in the afternoon so she could begin learning. We had the privilege of spending Sunday afternoon with my friend Judith and her children. They joined us for lunch and the kids played together most of the afternoon. Judith took me around to the nearest market and to visit some people in the village of Buundo. Overall, Sunday was a good day. Today was David's birthday! After school, the kids and I came back to our home to make frosting for the cake. We had a team potluck dinner, so it was fun to celebrate with our team. After dinner we were walking back to our house and out of nowhere, people come running at us. Here in Uganda it is a tradition to "water" (throw water on) someone on their birthday. Our students and the older kids who live here at GSF, had all gotten large basins full of water. Henry held David while they drenched him! There was not a dry stitch of clothing on his body. Then they all sang "Happy Birthday" in their upbeat Ugandan way. David just started dancing soaking wet in the street. It was a fun memory. We are so glad to be here on campus! Many of these fun times were not possible when we were living in Jinja, needing to drive back each night. We are so grateful for these first few days on campus and look forward to many more!